Helps to support normal levels of mental awareness. Known to enhance memory and learning capacity. Helps treat insomnia and convulsions. Assists in reducing anxiety and stress-related disorders. Supports treatment of mental fatigue. Helpful for occasional absentmindedness and lack of concentration. Supports the body's normal preservation of brain cells and its function of memory, focus, logic and alertness. 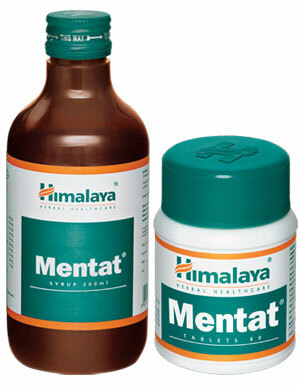 * Mentat DS syrup is a sugar-free formula recommended for patients with hyperglycemia, diabetes mellitus and also for calorie-conscious individuals. Syrup: 1 teaspoonful (5 ml) twice daily. Tablet: 2 tablets twice daily. DS syrup (sugar-free): 1 teaspoonful (5 ml) twice daily. DS syrup (sugar-free): Pilfer-proof bottle of 100 ml.